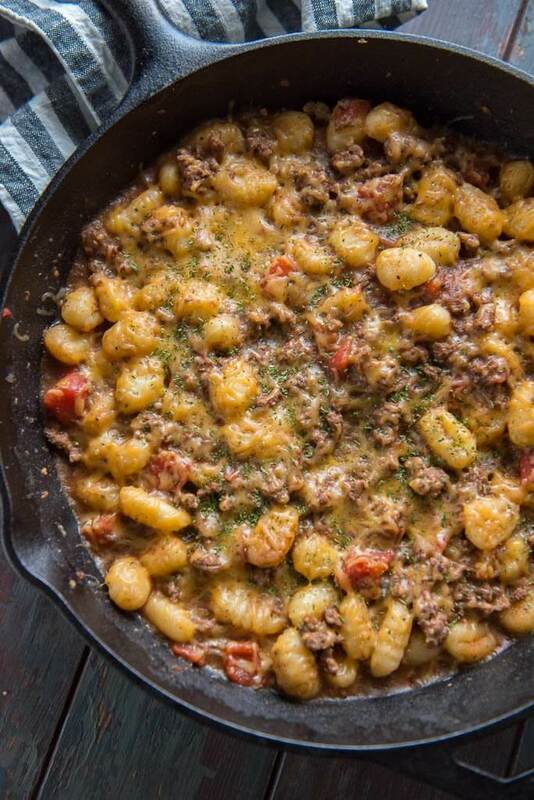 Delicious and easy Cheeseburger Gnocchi Skillet is bursting with flavor and is healthy, too! Eating healthy food is important to me, but so is eating good food. I don’t believe to live a healthy life means you have to give up the foods you love. 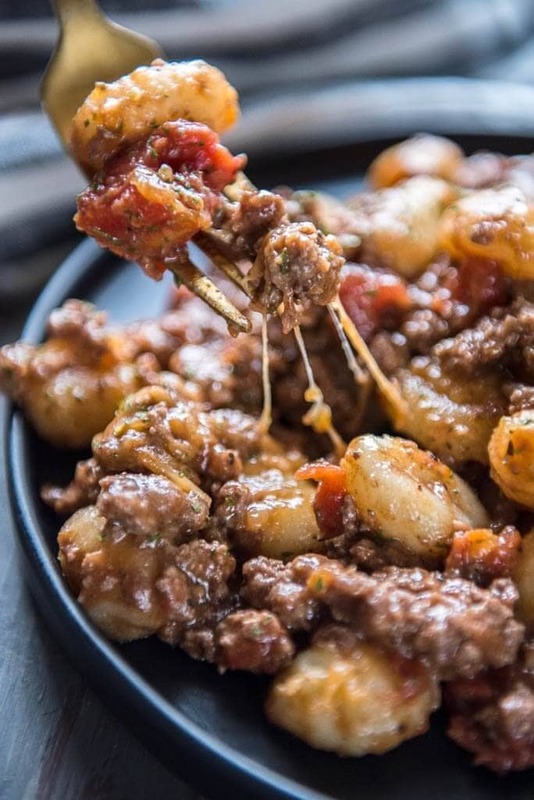 That’s why I love this Easy Cheeseburger Gnocchi Skillet. A few years ago I had gnocchi for the first time. OH. MY. GOODNESS. If you have never heard of it please don’t let that stop you from making this recipe. I have a sneaky suspicion you are going to love it! Is gnocchi pasta or a potato? Gnocchi is a “dumpling” made from potato, semolina, or flour and they are like little pillows of amazing-ness. 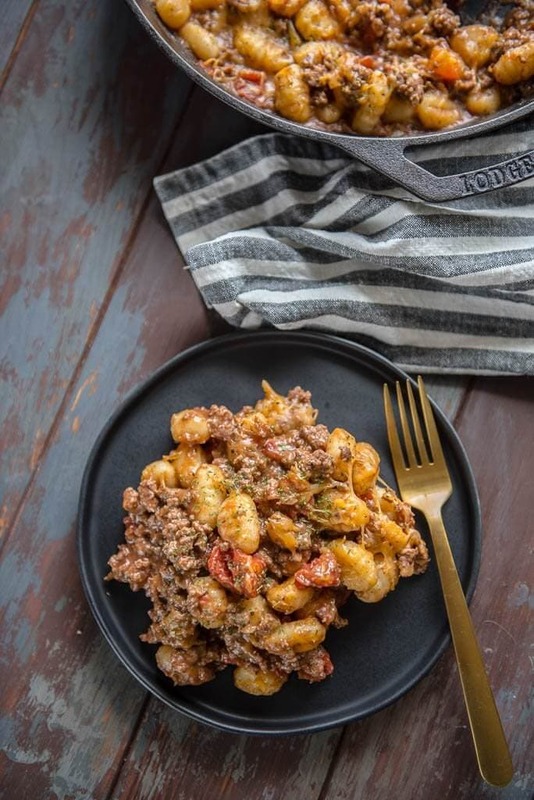 Seriously, my entire family loves gnocchi and I know you are going to as well. 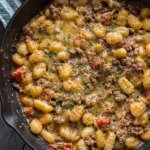 This Easy Cheeseburger Gnocchi Skillet is quick to prepare and is bursting with flavor. Dare I say it might even be better heated up as leftovers the next day… if you have any left! If you’ve never bought gnocchi before you can buy it at most grocery stores, and even Target (that’s where I got mine). It is found near the pasta. It’s not a pasta, the kind I’m using for this recipe is made from potato, and it’s so easy to prepare. You just put a little butter in the skillet, let it melt, then cook the gnocchi until it browns up! Then set it aside and prepare the rest of the meal and add it back in at the end to let it simmer and cook all the way through. What I love about gnocchi is it is so versatile. I’m already dreaming up new recipes so if you love this one be sure to comment below and rate the recipe! I want to create recipes you enjoy, your family loves and makes you feel like eating healthy isn’t a chore, but is much more satisfying than you thought it could/should be. I want to help change the way people think about eating “healthy”. How do I help my family eat healthy without “dieting”? Incorporate foods we all love, in moderation. Nothing is off limits. We eat all food groups. Discover ways to “lighten” up our favorite recipes by using more nutrient dense foods. This recipe gets rave reviews and I’m so glad everyone loves it as much as my family does! Please pin it on Pinterest and share it! Melt butter in skillet over medium-high heat. Add gnocchi to skillet and cook for 3-4 minutes until it turns golden brown on each side. 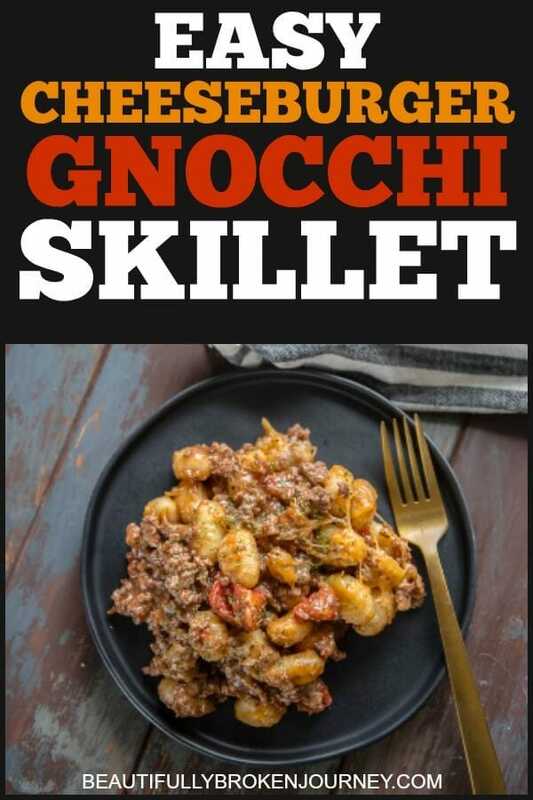 Remove gnocchi from skillet and set aside. Add onions, garlic and beef to skillet. Add salt and hamburger seasoning and cook until beef is no longer pink. Drain if necessary. 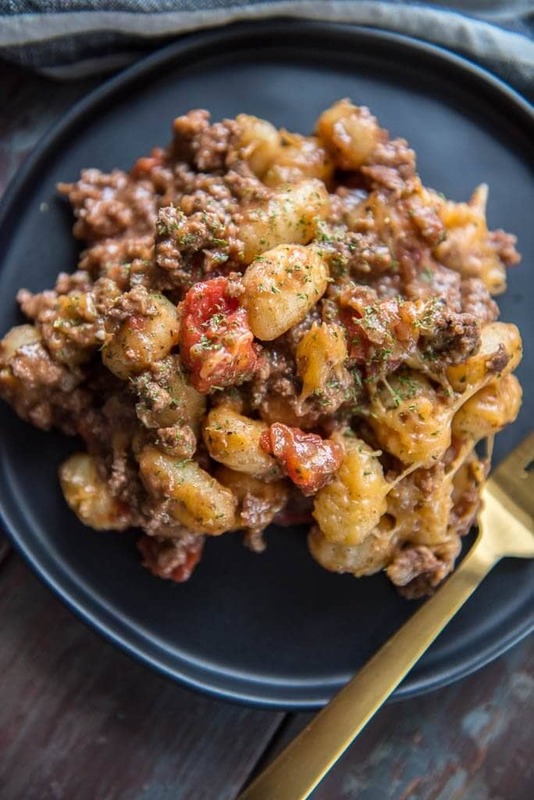 Place beef mixture, diced tomatoes, beef broth and gnocchi in skillet and cook until it starts bubbling. Reduce heat to low-medium and cook until liquid is minimal. Sprinkle cheese on top and place a lid over skillet for 2 minutes to melt cheese. 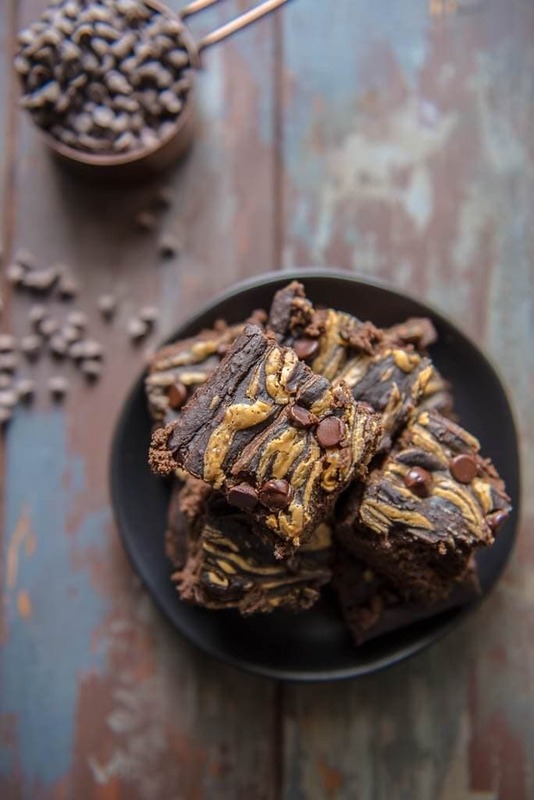 If you are looking for a healthy dessert to go with dinner try my Black Bean Brownies with Peanut Butter! Oh, this looks so yummy! I have not tried gnocchi, but I want to now! I’m on WW and enjoy finding new recipes that are both healthy and delicious! Thanks for 1his one! I hope you love the recipe, Kathy! Gnocchi is so good! Looks delicious. I love gnocchi. I’ll be trying this recipe this week! I hope you enjoy it, Michelle! Made this tonight with 99% fat free ground turkey. It was excellent! Thanks a million for the recipe. I am so glad you enjoyed it, Sue! Where do you find the gnocchi? Most grocery stores carry it. I bought this at Target. I made this tonight and we loved it! The gnocchi was a nice change from our normal routine meals. Also it’s so easy to make. I definitely will make this receipe again!! It’s a keeper! !’ Thanks for sharing! So glad you liked it, Sara! Is the gnocchi with the dry pasta, or is it a fresh pasta, or is it sithvthe frozen pasta (like ravioli)? Thank you! Hi Julie! The gnocchi I use is the kind off the shelf that is next to the pasta so it’s packaged, not fresh. You can use fresh though if you’d want and just cook it accordingly! Hi Amy, for the packaged gnocchi, do you cook it before you brown it in the butter? Or do you brown it and then it cooks in the beef broth when you add it later? Browning it in the butter cooks the gnocchi. You will sauté it until it turns golden brown. Trying this recipe tomorrow but will substitute ground turkey for the beef because that’s all I have. Can’t wait to try this. Thank you! I think it’ll still be good with turkey! Made with ground turkey and it was absolutely amazing! Lunches done for the week! Awesome! So glad you enjoyed it, Lisa! I put the nutritional information into the ww app and it came back as 8 freestyle points. Just thought you should be aware. Looks good – dinner tonight! That’s because it calculates all the nutrition info, and doesn’t take out the calories for zero point foods. If you enter it into the WW recipe builder it should be the same calculation I have calculated. Do you think this would work with cauliflower gnocchi? I have not used the cauliflower gnocchi yet, so I can’t answer one way or the other. I made this and it was so good! Probably the best recipe I’ve made in awhile and I used it as my meal prep. I plan to make this again soon. Thanks for the recipe! I’m so glad you enjoyed it, Nina! I made this tonight. It was delicious. In fact my husband referred to this meal as “The bomb!” This will definitely be part of my meal rotation. Thank you for sharing! YAY! So glad you both enjoyed it! Can you use frozen gnonocci? Just wanted to report back that I made this using the Trader Joe’s cauliflower gnocchi and it was delicious! I used 10oz of 85% beef, because it’s what I had on hand, and drained it before I added the onions. That amount of meat was actually great, since the bag of cauliflower gnocchi is 12oz, vs. the 16oz bag of traditional gnocchi that the recipe calls for. It still made enough for my boyfriend to have seconds, and for me to pack up a serving for lunch (it reheated well in the microwave, even with the cauli gnocchi). Other minor tweaks included using fired roasted tomatoes and spicy Montreal Steak seasoning for a bit more of a kick, but we weren’t serving this to kids. Thanks so much for sharing your recipe inspiration, Amy! Thank you so much for letting me know it worked with the cauliflower gnocchi! I’ve had people ask and hadn’t had the opportunity to try it out yet! Glad you enjoyed it! Wow! This recipe is awesome!!!!! So full of flavor. Easy to make. I have lost 31 pounds on Weight Watchers, so I used grapeseed oil instead of butter and reduced it to two teaspoons. One to brown the gnocchi and the other to saute the onions and garlic before adding the meat. I used 93% lean turkey and it was heavenly. This is going into rotation! Thank you for an awesome recipe! Was i supposed to drain the tomatoes?? There’s so much liquid! No, did you leave it uncovered to help with the liquid?